This marvelous treasury of card magic presents the exact details of 155 professional card tricks-none of them requiring sleight-of-hand dexterity-assembled by the world's number-one wizard, John Scarne. 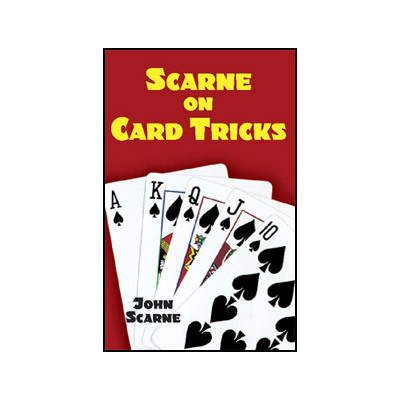 An authority on gambling and card tricks, Scarne won renown for teaching professional gamblers how to sharpen their skills and avoid being fleeced. For this collection of mystifying and effective maneuvers, he assembled an exciting series of original effects and classic card tricks, reworked to eliminate the need for sleight-of-hand. Simple instructions and clear diagrams illustrate Houdini's "Card on the Ceiling," Blackstone's "Card Trick Without Cards," Carlyle's "Piano Card Trick," Milton Berle's "Quickie Card Deal," and dozens more. Also included are Scarne's "Drunken Poker Deal," "Knockout Card Trick," and others from his repertoire-tricks that have fooled some of the world's leading magicians. Scarne presents all the tricks with advice on accompanying patter, offering helpful suggestions about the kinds of words and gestures that give performances a professional gloss. Anyone can learn these tricks, and this single volume contains everything a would-be master of card magic needs to know. Paperbound, 308 5 3/8" by 8 1/2" pages, fully-illustrated.